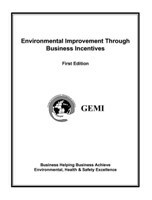 Environmental Improvement Through Business Incentives assesses incentives that have worked in government and in the private sector to encourage companies to go beyond compliance. The report includes tables of environmental objectives that might be achieved through the use of incentives, and provides a menu of incentives that could help achieve those objectives. Environmental Improvement Through Business Incentives contains 2 tables of environmental objectives. The first of these tables identifies and summarizes several environmental objectives that can be advanced through the use of incentives. The second table identifies and summarizes several options for voluntary environmental incentives. Both of the tables are intended to give policymakers ideas on the type of incentive mechanisms that can be deployed and the type of environmental improvements that can be achieved through the use of such incentives. In order to achieve the desired result, an incentive must match a business’ needs (or those of other regulated entities, such as a publicly owned treatment works). Because the needs of businesses vary, it is crucial that there be a variety of incentives available. For some types of businesses, speed to market is critical. For example, they need a way to avoid the delays associated with environmental administrative processes. Others may be most driven by costs and need a way to achieve savings. In cyclical businesses, an incentive that is not attractive at one point in the business cycle may well be attractive at a later date. Smaller businesses may need different incentives than large companies. The key point is that a wide range of incentives is needed to address the incredible variety of industries and even companies within industries that are affected by today’s sweeping environmental rules. The development and implementation of many types of incentive options will both need and benefit from the active involvement of a broad spectrum of stakeholders. In particular, those incentive options that modify existing regulatory requirements for a company or facility will necessarily demand such stakeholder participation. This report focuses specifically on addressing community or stakeholder involvement in describing potential incentives options. However, we assume that transparency in process and genuine opportunities for stakeholder involvement are givens in any incentive program. The “Environmental Benefits Through the Use of Incentives” table identifies several environmental program objectives that can be achieved through the use of incentives. These program objectives range from encouraging the reduction in specified pollutants to improving the deployment of program resources within an environmental regulatory program. Note that it will always be up to the governmental decision-maker (with input from stakeholders of all kinds) to decide the amount of program benefit that is needed to balance the benefit to the company receiving an incentive. As with companies, different programs, different areas or different times may change this balance. In some cases, a regulator may want to use incentives to address the most pressing problems (e.g., air, water) in the area in question. In other cases, freeing up enforcement or permitting resources to be used in more productive activities may be a critical consideration. How much of a given benefit the agency (or the environment) must receive to warrant granting a given incentive will be very much a case-by-case determination. The “Environmental Incentive Options” table provides a listing of various incentive options. Once again, it is important to bear in mind that a menu of incentives is needed to address the wide variety of businesses (or other regulated entities) with their varying and changing needs. Incentive options are divided into five categories: permit incentives; product review and approval incentives; other regulatory incentives; tax incentives; and capital incentives. For each incentive option information is provided on who would grant or enact the incentive and if and how such an incentive mechanism is being used today. It is important to note that these options are not necessarily mutually exclusive. For example, a permit incentive program might include automatic permit extensions, expedited review time and consolidation.